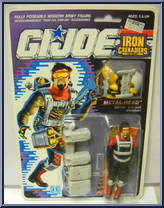 METAL-HEAD is a walking anti-tank weapon! He can launch high-explosive tubes and guide them to their objectives on a laser beam, without the use of his hands or his feet. 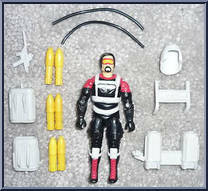 His voice-activated weapons' command system is made up of circuits and targeting computer modules built into various components of his blast suit. All he has to do is make visual contact with the target, let the computer "read" the range, plot the trajectory, wait for the green light to flash, then yell "bang" to complete the firing sequence. "The real targeting computer is upstairs in his brain, and it doesn't have an 'off' switch. This guy is so wrapped-up with his work that even when he sits down for dinner he's preparing for battle. He tests his visual acquisition sensors by locking onto the mash potatoes as they are passed from one end of the table to the other. He calculates wind deflection by observing how the steam rises off the meat loaf. He even measures the diameter of the green peas, seeing them as micro-targets. If he looks you straight in the eye, you'll feel as if you have a bullseye on your forehead."